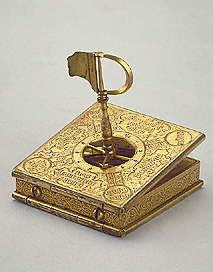 Unusual for a compendium by the renowned Augsburg maker Christoph Schissler, this instrument bears mainly arabesque patterns and consists only of a 'wegweiser' with a wind vane, a universal equatorial dial and a horizontal dial with an inset magnetic compass and a list of latitudes. The compendium is undated, but the comparison with dated instruments suggests that it is one of Schissler's earliest pieces. A very similar compendium by Schissler was sold by Christie's South Kensington in November 1997.